A man has been arrested as part of enforcement activity into organised crime in West Lothian. On Thursday, October 20, around 50 officers, including CID, uniform, dog unit and armed response, were involved in intelligence-led searches a four addresses in Uphall, Winchburgh, Philipstoun and Bridgend. During the search of a property in Glebe Place, Uphall, air weapon gas canisters were seized, while activity at a home in Castle Terrace, Winchburgh, resulted in the recovery of small quantities of cannabis and various pieces of cultivation equipment. Various weapons including a crossbow and bolt, an axe, a dagger and hunting knife were found in an address in Church Court, Philipstoun, along with a quantity of cannabis. The search of a house in Auldhill Entry, Bridgend, resulted in the arrest of a 30-year-old man, who is scheduled to appear at Livingston Sheriff Court on Monday, October 1. Officers are continuing with this investigation and are following positive lines of inquiry. Detective Inspector Paul Batten from the Lothians and Scottish Borders Proactive Unit, said: “After intelligence was received relating to illicit items, including weapons and drugs, being within a number of West Lothian homes, swift enforcement action was carried out resulting in these recoveries and the arrest, so far, of one man. 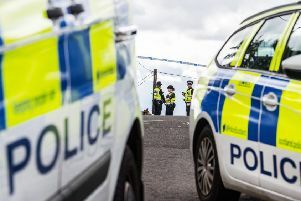 “Our inquiries are continuing and the public can rest assured that all resources at our disposal will be utilised as we continue to target those linked to organised crime in West Lothian.